The Ghost of Krankor’s Ship! Japanese Kennys hide behind every tree, ready to insert themselves into your kaiju feature! We open with Mickey and Kimmy having dinner at Johnny’s house. The kids rush outside to look at the sky with Johnny’s new telescope, because kids love telescopes. Johnny’s father is Dr. Macken, who along with his wife Susie are also entertaining Dr. Macken’s lab assistant, Dr. Sangerman. The adults talk amongst themselves about how their friend Wally adopted Mickey and Kimmy and is even teaching them how to make money polishing shoes – which the film just refers to as bootblacking. Wally arrives just then, his constant tardiness and absenses that paint him as a bad parent are but a clever ruse to allow him to run off and be Prince of Space. But at this point in time, there has been no need for the Prince to appear on Earth, thus Wally just looks like a horrible parent. Wally at some point worked at Dr. Macken’s lab and helped him invent the new spectacular rocket fuel that will become the focus of the first half of the film. What credentials Wally had for making rocket fuel is never espoused on, nor why he gave up this potentially lucrative career to shine shoes. The kids return inside from the telescope to watch the world championship fight. In the background, the Macken family maid is seen taking down the telescope. This is marked on IMDB as a visible crew member sighting, but it is in fact part of the actual film. They don’t call it the Inaccurate Movie DataBase for nothing! The fight is interrupted by video of a rocketship. Has sports gone scifi? Is Johnny too dumb know how to change the channel correctly? The kids are confused and argue if whether or not it is a commercial…until the announcer announces that it’s an important message! It’s the Krankor Exploration Force – “Do not be alarmed” says Phantom of Krankor, who then threatens the entire planet. I’d hate to see what he would say if he wanted us to be alarmed! Dr. Macken mentions that Krankor is the ancient name of the dark planet. You know, Krankor! The dark planet! Full of….DARK!! And ANCIENT!!! Prince of Violating Emissions Standards! We can’t get beat by some guy wearing his grandma’s coat! Shoot more! Gee, I wonder what his intentions are…. The next day, Dr. Macken is holding a press conference about the aliens (no one explains why he’s the big go to expert on this crisis and not the Prime Minster of Japan, though we’re to assume his rocket fuel expertise must make him an expert on space aliens by association), while Wally is teased by Mickey because he says he’s scared of the spacemen. Way to not discipline your kid, Wally! Dr. Macken is one of those guys who thinks everything is about him and his magical Rocket Fuel. Except this time it probably is. He explains that even though the spacemen are advanced with spaceships, their fuel efficiency standards are sub-par, probably due to excess lobbying by oil companies to keep the miles per gallon guidelines low. As you can imagine, this has made them quite desperate as their fossil fuel reserves deplete, so they’re eager to invade an energy rich country and steal their fuel formula resources. The only washing machine that has a cockpit! The invading Chicken Men are stymied by grass. GRASS! Some press guys talk amongst themselves about how this might be the last day on Earth. So they just stand around solemnly nodding, like everyone would do on their last day on the planet. These characters are minor in Prince of Space, but play slightly larger but still useless roles in the two Yusei oji flicks. The ship arrives, and buzzes around Tokyo while making goofy space noises. WHIZZZ! SWOOOOP! Meanwhile, something weird is happening at the Japanese town of Beaver Falls. Like the fact it is named Beaver Falls, for starters. Also electrical disturbances and Krankor’s ship landing there, but that’s not important as the etymological reason for the town’s name. WHY??? If you are wondering if beavers live in Japan, the answer is no. The cops caravan over to the landing site, a big field. We see nothing but an alien periscope, because building a whole giant rocket set is expensive. Dr. Macken arrives as well, because if aliens are coming to Earth to steal a rocket formula, we should put the main inventor as close as possible to the aliens. And bring along his kid! And also the kid of that shoeshine boy! I know when aliens invade, I’m bringing my children close to the landing site. So I can toss them at the aliens to eat while I escape! And now for our War of the Worlds scene as the humans head closer to the periscope. The kids Mickey and Johnny also sneak in closer and hide behind some trees. Mickey delivers the classic line to Johnny: “I’m not afraid if you are go on home” said in a pure monotone voice with no pauses, causing the sentence to become a run-on mess of confusion. It’s nice to see sentences worse than the ones I write! The periscope then starts blasting some of the soldiers and broadcasts a warning to not get close. Krankor seems like he came to Earth with all these ideas about being in charge, but doesn’t really have a plan when he gets here and is just sitting in a chair furiously trying to come up with a plan, snapping at his subordinates. My antennas help me aim! Great, it’s a huge space convention here at Beaver Falls! The new ship lands and is fired at by the Krankor vessel – though the film doesn’t bother to animate the laser blast even though they added a smoke effect on the landed spaceship. The attack does no damage, and out strolls Prince of Space! “I am Prince of Space!” Prince of Space warns Phantom of Krankor to get off of Earth because no one wants him here. Also this is the last warning. And the first warning. The only warning. The only reply Krankor gives is more laser blasts, which Prince of Space just dodges. Prince of Space then says for the first time his famous taunt that Krankor’s weapons are useless against him! The bigger laser blasts also do nothing. Because Krankor’s ship is running lown on energy, so they decide to leave. Krankor vows that he will use the emergency reserve power to get Prince of Space…later. Not just the emergency power or the reserve power, but the emergency reserve power! But first he has to think of a plan, a plan involving shooting Prince of Space. Krankor sends in the Cabbage Patch Brigade! Prince of Space shadows them in his own craft…so Krankor plots to shoot at Prince when he gets closer. The furious mess of negative scratches representing lasers does no damage to Prince of Space or his ship. So they discharge the Caustic Vapors! Basically, they make it foggy in space. As a Bay Area resident, I can say this week fog wouldn’t even slow down traffic! It does nothing to Prince, who just stops following them probably out of boredom. Or maybe he spent the extra 50 cents for the super wax at the car wash and doesn’t want it ruined by the Caustic Vapors. The next morning some international guys who may or may not be the UN talk about the aliens. Wally shows up at the bootblacking station and the kids ask where he was last night. He says he was out with an old friend for dinner, but keep in mind these are his kids. He adopted them. That means he hasn’t seen them the entire night, nor in the morning, not at all until they were already at work. And he didn’t check up on them, despite an alien invasion and one of the kids being brought to the field where the killer aliens landed and murdered people and had a huge laser battle with another space alien. And who knows where Kimmy was! Wally isn’t even pretending to be concerned about the kids. Some hero, Mickey could have deep psychological damage from seeing humans getting murdered by alien monsters. But who would know? Definitely not Wally. Mickey calls Wally a coward when Wally says he believes in peace and would fight Phantom to get peace, then Mickey leaves the job to go to Johnny’s house because they’re trading off looking through the telescope for the spacemen. Mickey commands Kimmy to stay where she is at work. Mickey really wears the shortpants in this family! Also good thing these kids don’t have school, they might learn something. We get a Children of the Corn-type sequence as the Krankor Chicken Men emerge in a field where tall grass is everywhere. The ship’s periscope is there as well. This sequence is funny because there are a bunch of birds flying around the field, including a bird that perches on top of the periscope despite it rapidly spinning around and around. You’d think this bird would get sick and ralph all over the periscope, but it never happens. The Chicken Men scan around and locate Prince of Space at an abandoned building, so they prepare the Underground Tank! It’s a tank that’s underground! We never see an Underground Tank, so who knows what the frak? Imagine waking up to this mug every morning! You cannot catch us, Prince of Space, this ship has been slow-roasted for extra moisture and tenderness! Mickey and Johnny theorize that Phantom is evil, as evil people always come around at night. “When nobody’s watching they also come in the day time!” says Mickey in an eerie line that is often far too true. 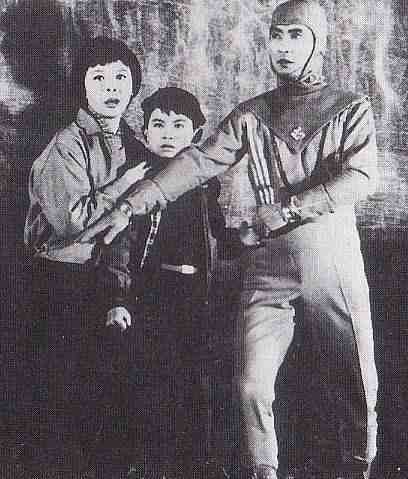 The kids see Krankor and the Chicken Men emerge from underground. This shows: A– Evil people come out in the daytime when people are looking because evil people are bold jerks, and B– The Underground Tank transported the Chicken Men there, but it stays underground so we never get to see it. Prince of Space is waiting for the aliens and laughs at them, then tells them to leave Earth again and their weapons are useless. Not being one to listen to common sense, Krankor and his men fire at Prince, the shots either missing him entirely or having no effect. Prince continues to appear and disappear around them, giving off cutting remarks as to how useless the weapons are. Because Phantom has performance issues, he gets a big hug cannon gun with multiple barrels to shoot Prince with. He also threatens to kill some “drffren”!! Differin the acne drug? No, it’s just a dubbing flub of “children”, but the line is left in because the dubbers truly cared about the quality of their creation. Enraged because his alien manhood is so easily tossed aside by a guy in a cape, Phantom flies up to the ledge Prince is on. Except the effects showing him doing so make it look like Phantom shape-shifted into a small doll that is pulled up to the ledge by a wire. Hilarious. Prince just jumps down, causing the entire special effects scene to just be a pointless exercise, further humiliating Phantom. He spent so much money on that doll replica of himself so he could do the cool stunts, and it’s all ruined! Phantom orders his men to get the kids, but Prince just shoots the guys in the head as they grab at the kids over and over again – his lasers cause mild irritation! Prince doesn’t want to kill them yet, because he’s one of those heroes who believes that bad people can learn lessons sometimes. But that won’t happen here, because then the film would be over! The most complicated car radio ever! The cops arrive as the aliens flee. Prince gives Johnny a calling device, knowing far too well that Johnny is way more responsible than Mickey. The cops find one of the spacemen’s guns, though this game-changing incident of alien weapon technology falling into human hands is never mentioned again. There is a scene where the cops take the kids back to Dr. Macken and discuss that the aliens are here to take his rocket fuel. Dr. Macken seems shocked and amused by the prospect, despite holding a new conference on the subject but a day before! Dr. Macken also mentions that the whole thing is a secret…YOU HAD A FREAKING NEWS CONFERENCE!!!!! You’re having a highly publicized rocket flight in another day or so! How is any of this a secret again??? Dr. Macken refuses to stop the test flight of the rocket despite hostile aliens flying around the country. Then Prince of Space calls(!) and demands they double the guard at the lab! Only double? The next we see of the launch base, it is packed with military guards. Planet of the Punk Rockers! Okay, time for Judge Krankor, starring me! Everyone’s guilty! The two boys are there as well, and they are going to call Prince with the device just because they can, then are grabbed by the hand of a Chicken Man! Okay, that’s not exactly true. Mickey is grabbed by a hand, then Johnny sees this and LEAPS FORWARD IN THE DIRECTION OF THE CHICKEN MEN WHILE SCREAMING LIKE HE WAS CAPTURED!! Phantom and the Chicken Men burst into the lab, blast the guards, and grab the rocket fuel formula from Dr. Macken’s safe. The kids finally take out Prince’s calling device out and twist it. Prince of Space instantly appears and shoots one of the Chicken Men, frees the kids, and then punches up other Chicken Men. Krankor escapes with the formula and Johnny as a captive, but Dr. Macken says “Take the formula, let the boy go” — so Krankor does! Except Johnny is a moron and keeps walking up the stairs with Phantom for a second or two until he realizes he shouldn’t be and stops. This is the second time the actor playing Johnny has gotten his kidnapping acting all wrong! He must have some sort of hostage fetish. Props to Phantom of Krankor for being a good dude and letting the kid go, a real class act. Though it’s probably because in the next scenes Phantom and Prince are sprinting through the launch area. Phantom manages to run far enough ahead to boobytrap the rocket and cause it to blow up. When Prince runs into the room to stop him, Phantom is hiding behind the door and escapes undetected. This is like a Bugs Bunny cartoon trick! The exploding rocket is pretty good model explosion effects for a film that probably couldn’t afford it. Phantom then escapes on his ship. Prince’s ship follows, but drops off a sealed canister into a puddle. It has a message from Prince about how he’s going to get the formula back. At this point we’re now switching gears because we’re entering the second Yusei Oji flick. On a flight from San Francisco, Dr. Macken’s wife’s brother is on the flight. Phantom of Krankor has a new ship that instead of having a drill in the front, is black and looks like a freaking fried chicken with some cool fins down the back. This ship buzzes the plane, and soon we learn the plane has gone missing. Japan sends a fighter pilot to investigate. We all know he’s toast from how much facetime he’s getting in the briefing meeting. He might as well talk about how he’s finally going to marry his girl or see his unborn kid for the first time for how big of a target he is. And, yes, as soon as he sees Krankor’s ship, his jet loses all power and just drops straight down while the pilot screams about a Black Dragon. You can’t kill us, we’re too stupid to know how to die! Dr. Macken is going to a conference, because science conferences wait for no man or Chicken Man! But he never arrives. We see a shot of Earth from space – with no clouds at all on Earth! Holy smokes! On the Krankor ship – the writing is in Thai! (I KNEW it!!) Dr. Macken awakens as a captive. Phantom has to introduce himself despite the fact they’ve met prior and Phantom has been clogging the TV airwaves with his awful laughing show that’s almost as bad as NBC’s Whitney. Almost. Phantom brags he threw the chaffuer into space. Phantom’s new plan is to show Dr. Macken how much cool stuff the aliens have so people will know opposing them is useless. This plan might have made sense had the aliens not been owned previously by Prince of Space. Speaking of Prince of Space, the Black Dragon ship is being tailed by Prince of Space. There is a space battle! Lasers blasting, negatives scratching, audio effects splicing. The Chicken Men drop the Poison Fog – not to be confused with Caustic Vapors – to blind him as they enter a meteor field. There is a long long sequence where Prince’s ship dodges meteors, which are styrofoam balls either blown at the ship by a fan or slowly tossed down on it by a stagehand. Eventually, Phantom says enough is enough and just declares Prince dead, then lands on planet Krankor. The approach to their base on Krankor is great, because the design of the base is flipping cool, and there is a giant monster guy just sitting by the base who roars as the ship lands. The giant is not mentioned for the longest time, so it’s like “Whaaaa?? ?” Phantom’s base is described as “castle cut from the living rock”…is the rock alive?? Because that’s a jerk thing to do. Phantom’s not known for doing jerky things… The cool castle design features lots of fins, because they make the castle go faster. I’m totally not suspicious in this hoodie, sunglasses, and surgical mask. So take your precious time, guys! Krankor has second thoughts about just declaring Prince of Space dead and sends some guys back to Earth to search for him using the X radar. Dr. Macken is taken to Phantom’s Great Hall – a room that looks like it was constructed out of Legos! Krankor brings out other kidnapped scientists, including the guy from the airplane. Krankor then says “The word impossible, is a word that for me does not exist!” The wit and wisdom of Phantom of Krankor. Phantom of Krankor shows video of Dr. Macken’s house and family, declaring Earth is 500,000 miles away. This is a bit odd, as the moon is only 238,900 miles away. Which means Krankor is only twice the distance as the moon. Is it behind the moon? Is that why we can’t see planet Krankor? 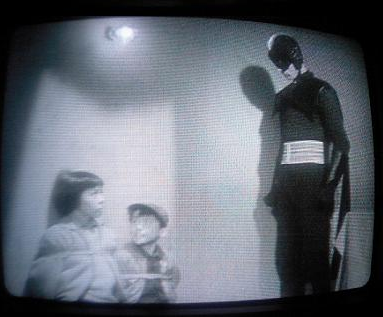 Phantom has been watching Dr. Maken’s family for a long time…in the shower, in the bedroom, that time Dr. Macken ate the cake that fell on the floor… Krankor wants them to tell Earth that it is useless to resist – they refuse, so Phantom says he’ll blow up a city! The scientists are given a dinner of large globs of dough shaped like eggs and dry ice in water. There is a funny scene when one of the guards gets mad at a sick scientist who refuses to eat, and shoves food into his mouth. Remember, these aliens are Chicken Men, so it’s like a mama bird chewing up food for the babies…except mama bird is a rude jerk! The scientists agree to tell Earth about Krankor’s advanced technology, but nothing more. These sellouts! Our planet is 80% mountains, 10% giant guy! No, YOU are a undeveloped villain motivated only by evil and not rational thought! The Chicken Man car with the X radar in it drives around Tokyo and finally picks up a signal. The two drivers are wearing surgical masks to cover their giant noses. They track him down as Wally the Shoeshine Boy! Phantom and his men return to Earth in their Black Dragon craft and arrive over Tokyo. “Attention, people of Earth. I’ve an important announcment to make. One you’ve been waiting for, long time!” Wow, Krankor is racist! Krankor wants Dr. Macken to speak to the people. He tells them about the technology, then says “People of Earth, you have only one response to make: Bombtheiro–!” Good advice there, Dr. Macken. You got your Ph.D. in mushmouth! Krankor announces that Earth has 24 hours to surrender or die. Wally walks home with the kids, obviously being followed by the Chicken Man car despite their orders not to be noticed. When they get to Wally’s apartment, there is a note on the bird cage from “Prince of Space” telling them to go stay at Johnny’s place, while Wally stays behind. Wally sends them off alone. Luckily the Chicken Men don’t bother to chase the kids, instead chasing after Wally who quickly turns into Prince of Space at a cemetary. More Chicken Men arrive, but as usual, their weapons are useless. Prince of Space then just beats up goon after goon. Phantom arrives with a big gun in a car. He’s smug at first, but then he realizes that once again his weapons are useless. USELESS!!! You’d think they’d learn, but you are wrong. The bigger the gun, the more hilarious when it fails! 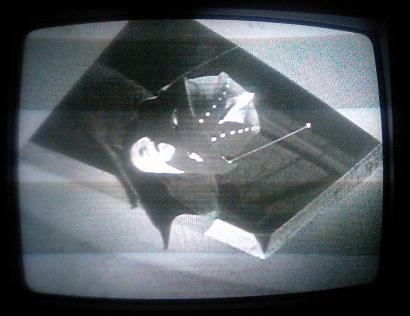 Prince of Space: Predicting flatscreen TVs 50 years early! Phantom demands Prince of Space come closer, who responds “I’m close enough, thank you anyway. The stench of your foul breath is more than I can stand!” Sick burn from Prince of Space! Phantom and his men escape to their ship, but Prince flies after them. The movie goes into deja vu mode as we do the Caustic Vapors in the meteor zone thing again. Once again, Phantom declares victory (??) and gives everyone four hours off (!!!) Phantom does order the Guardian to stay awake, just in case. Phantom tells the scientists he going to shoot them into space in a rocket to a random location, crashing into stars and black holes and stuff. Prince of Space is here! His ship approaches the planet Krankor. Just like Begger’s Canyon back home! Hi, somehow the gas breath starts from behind my head. Just don’t ask why! We get a good look at the Guardian – giant ears with wiggly powers, the Krankor Chicken Man nose, bumpy skin, metallic collar, wrist guards, and belt. Guardian is overweight, he needs to go on a low-carb diet. To much snacking on invading spaceships! Guardian breathes poison breath onto the Prince’s ship, and then breathes flame. Judging from that, Guarding also needs to go to the dentist, because that’s the worst bad breath I’ve ever seen! Prince just shoots him in the mouth like 10 times and he dies. A shameful Guardian. Phantom fires guns from the fortress, which blast Prince’s ship, and we see it drop straight down. Phantom declares victory for the umpteenth time. But once again Prince just shows up and charges in, blasting Chicken Men in the head. Phantom tries trap doors and hidden snipers, to no avail. Prince of Space is done playing, and it’s time to clean house. Phantom’s master plan is a dropdown grill mousetrap device that traps Prince, and Phantom activates the heating element to broil him alive. This will totally work when nothing else has… To make sure, dozens of guns pop through holes in the wall, in a scene that takes a long time for all the guns to go into place. But nothing doing, Prince of Space is still alive and mocks them because their guns don’t work on him. Phantom’s plan? Fire guns!!! Prince of Space runs around with the scientists to try to escape. The scientists are dumb dumb dumb, almost walking into Chicken Men, then getting everyone trapped in some walls. Phantom says he’s leaving for Earth and will just leave them there trapped in his castle. Because that’s totally a good idea. Maybe Phantom has a brain tumor, that’s why he’s making such erratic desicions. Someone schedule an MRI! Careful! That model cost like $20! Sometimes I wish the rain would come down and wash away all the me off of this planet. Prince explains this was all his plan to have Phantom prepare his ship (WHAT?? ), the gimmick being he can use it to transport the scientists back to Earth. Prince then escapes with the scientists, and tells Phantom there are thorium bombs all over the base. Which there is, but then Phantom tells his goons to capture the scientists. This results in a lot of dead goons who are instantly shot in the head by Prince of Space. Prince loads the scientists onto the Black Dragon ship as the bombs in the castle starts to explode. Phantom is blown up and buried in debris, we’ll never know what was medically wrong with him now! The distinctive construction style of leftover wood pieces found around the high school’s bandsaw! You got to hand it to Phantom of Krankor, I’ve never seen a villain so completely and utterly allow the hero to further and further emasculate them, step by step by step. Phantom assists in his own demasculinization and eventual metaphorical castration and death. The guns he brings are bigger and bigger and all are ineffective against Prince of Space, who continually warns Phantom again and again that the guns won’t work, tries every effort not to kill Phantom’s men or Phantom himself. Phantom instead does everything in his power to escalate a hopeless situation into something even more hopeless. Without a major female character for either of the two main characters, their relationship becomes the default romantic relationship in the film. Phantom is self-destructive, he must live life on the edge, pathological urges force him to intensify the confrontation with Prince. It grows ever more dangerous, Phantom of Krankor laughing all the way. He doesn’t even recognize the depths of his own self-destruction, he’s too focused on actually sabotaging everything he’s built. This is the ultimate dysfunctional obsessive relationship. Prince of Space doesn’t seek out Phantom, doesn’t want to hurt him, doesn’t want to destroy him. His hand is forced. Phantom acts out as a cry for help, but he’s too far gone, to absorbed in the ride. There is no helping Phantom, no more. Prince’s efforts to hold back are all for naught, he’s forced forward. You can’t stop the juggernaut that is Phantom of Krankor as he spirals downward to the depths of Hell. Just come along for the ride and Prince of Space will drop by to save everyone again. My migraine magic wand strikes again! Prince of Tired of Your Crap, Time To Die! And never fear, Prince of Space will return in reviews of Yusei Oji and Yusei Oji – Kyofu no Uchusen! Upperclass kid in business suit, while the blue collar working class kids wear overalls. Hmmmm…. Even their periscopes have antennas! Forget the bootblacking, we’re beginning our Gilligan training now! We’re reporters trying to find out why we’re in these films! We have reason to believe Krankor will attack this painting of a spaceship! Dad got drunk and smashed my model rocket again! Stripe was our favorite Gremlin! I’ve got ya now, ya scum! This is great stuff you’ve got there. Can you review Jungle Prince and Secrets of Pilon?